Heschl’s gyrus and planum temporale regions drawn on a coronal MR slice (left), and a 3D rendering shown overlayed on an axial MR slice. Magnetic resonance imaging (MRI) has been useful in revealing subtle structural brain abnormalities in schizophrenia patients, including ventricular enlargement, volume reduction in the frontal and parietal lobes, and gray matter reduction of medial temporal lobe structures (see Shenton et al., 2001 for a review of abnormal MRI findings in schizophrenia; see also McCarley et al. 1999). 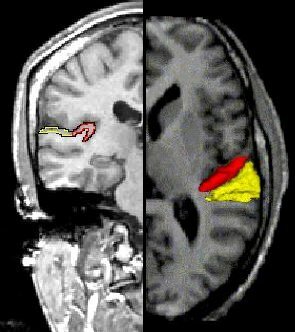 It is unknown, however, whether the brain abnormalities observed with MRI in schizophrenia are confounded by chronicity or whether there is a continual degenerative process. Chronic schizophrenia patients may demonstrate pathology secondary to chronic neuroleptic medication and long-term institutionalization. Examining first episode patients can thus obviate chronicity-related confounds. Drs. McCarley, Shenton, and Salisbury have spearheaded efforts to evaluate first-episode psychotic patients, including those who at 6 months have a diagnosis of schizophrenia, as well as patients with a diagnosis of bipolar disorder. Findings (see publications tab) suggest that within the first year changes are observed in the superior temporal gyrus region of the temporal lobe, including Heschl’s gyrus and planum temporale, brain regions important in primary and secondary auditory processing. Another area of scientific inquiry is in high risk populations, populations who are at risk for developing schizophrenia. High risk is generally defined as clinical high risk where there are symptoms observed that do not meet criteria in what is considered a prodromal stage that may or may not lead to schizophrenia, although the risk is greater than in the general population. The percent of those who are at clinical high risk varies between 15 and 30% within one year of symptoms (see publications tab for specific studies). The other high risk group is genetic high risk where one or more family members has a diagnosis of schizophrenia. In some cases there is also a focus on family members of those who either have schizophrenia or are at risk for developing schizophrenia. High risk populations are of particular interest because there is the possibility of identifying biomarkers that predict those who will convert to a diagnosis of schizophrenia versus those who do not. Such information can then be used to identify these individuals early and to intervene with earlier treatment (see publications tab for specific studies).